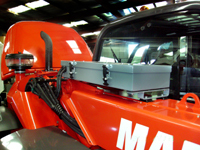 Airmaster provide a wide range of commercial vehicle air conditioning services. We use quality component parts and fittings and take the time necessary to design durable systems that work how they should. • Hose and pipe replacement & repair. • Cabin Pressurises and Air Filtration.